Eurochem, a Russian fertilizer miner and manufacturer owned by Andrei Melnichenko, is suing the South African mine technology company Shaft Sinkers for $800 million on account of a mining technology which Eurochem says has failed in Volgograd (image right). Shaft Sinkers says the technology works perfectly well, in Yorkshire (left) for example. $800 million is the sum of Eurochem’s claims. Much less than that is at stake — according to Shaft Sinkers $15 million in unpaid invoices – but also much more, in Kazakhstan, where Eurochem’s plan for a large new phosphate mine is in trouble of another sort. About that Eurochem doesn’t want to talk at all. In 2008 Eurochem made several announcements about its new potash mine, Gremyachinskoye mine in Volgograd. In the context of Melnichenko’s proposal to reduce his personal exposure in the company, and sell assets to Gazprom or shares to international investors, Eurochem reported growing reserves, speed in mining new output, and jumping sales revenues. Gremyachinskoye was to be commissioned in two stages, start shipping 2.3 million tonnes of potash per annum in 2012, and by 2015 double that volume. Potash hasn’t been the winning bet Melnichenko (92% of Eurochem’s shares) and Strezhnev (8%) were counting on. The commodity price peaked at $900 per tonne; collapsed to $300; and is currently at $391.50. During the five years in which Shaft Sinkers has been excavating at Gremyachinskoye potash has failed to reach Eurochem’s breakeven point. According to Shroder, “Instead of freezing, where one drills holes 500 metres deep, freezes the ground to this depth, and then sinks the main shaft through frozen ground, we cover-drill up to 42 metres ahead of ourselves. If we intersect water or running sands, we pump cement or resin grouts into the material, until it solidifies. then we drill and blast through.” This is a Canadian description of the grouting technology for holding back water and preventing cave-in – common hazards in potash mining the world over. For the next four years what seemed obvious was that everything was going swimmingly. The Eurochem contract – Shaft Sinkers’s biggest, representing about 30% of its order book – enabled Shaft Sinkers to move from private ownership shared between Shroder and black empowerment enterprise partners to an IPO on the London stock market in December 2010. By then the control shareholder was International Mineral Resources (IMR), an affiliate of ENRC, the Kazakh mining conglomerate, which had bought out most of the South Africans. In fact, as much later announcements from Eurochem revealed, Eurochem told Shaft Sinkers it was terminating their contract at Gremyachinskoye on April 20, 2012. Why Eurochem pretended nothing was happening isn’t clear. Here is Eurochem’s first- quarter IFRS financial report, issued on May 22, 2012, one month after the contract ended: “We continued making good progress on our two potash developments in the first quarter of the year. In southern Russia, shaft sinking operations at VolgaKaliy’s skip shaft #1 hit the 500 meter mark late in the first quarter. As at 18 May, the shaft had reached its approximate midway point of 550 meters. The future mine’s cage shaft continued being readied for freezing with sinking operations set to resume within the next twelve months.” Note that the skip shaft was the German project; the cage shaft was Shaft Sinkers’. Eurochem was intentionally misleading in this claim. This announcement is also noteworthy because of Eurochem’s calculation of the liability. It took several more months before it was disclosed publicly that Eurochem was raising the amount of its claim to $800 million to include purported lost profits because of the production delay. This amount appears in a Shaftsinkers report on February 13, this year. Russian courts don’t accept this type of damage claim. Whether it will be allowed by the two arbitration tribunals in Zurich and Paris, to which Eurochem has applied, remains to be seen, not least of all because Eurochem claims lost profits when the price of potash is still below the cost of mining and selling it. In Eurochem’s reporting of the dispute with Shaft Sinkers, the details are to be found in the auditor’s notes to the financial reports for 2012. In its audited accounts Eurochem also fails to provision for Shaft Sinkers’ counterclaim ($54 million in press reports, $15 million in Shaft Sinkers’ reports). According to Eurochem’s auditor, “Write-off of a portion of the assets at the Gremyachinskoe potash deposit. Following an earlier termination of the construction contract, in October 2012 the Group filed a claim against Shaft Sinkers (Pty) Ltd. (Shaft Sinkers), seeking US$ 800 million compensation for the direct costs and substantial lost profits arising from the delay in commencing potash production. This was a result of the inability of Shaft Sinkers to fulfill its contractual obligations and complete the construction of the Gremyachinskoe cage shaft, primarily due to problems with the grouting technology. In October 2012 Shaft Sinkers presented an interim claim letter to the Group claiming compensation of US$45 million in costs incurred by them up to and inclusive of 30 September 2012 in connection with the termination of the construction contract. Management believes that this claim is without merit. The above disputes are subject to arbitration as specified in the contract. An outstanding advance given to Shaft Sinkers of RR 495,387 thousand was written off during the nine months ended 30 September 2012 (nine months ended 30 September 2011: nil). Due to the failure of the grouting technology employed in the cage shaft construction, expenses previously capitalised, amounting to RR 3,116,000 thousand, were written-off during the nine months ended 30 September 2012 (nine months ended 30 September 2011: nil). 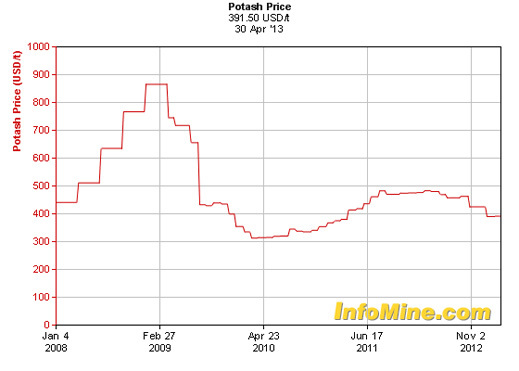 Since the potash price is well below where the miners would like it to be, mining less potash is one way of putting a bottom under the price. Eurochem’s Russian potash rival Uralkali implemented a production cut in 2012 of 8%. In the first quarter of this year, Uralkali said it is cutting by another 40%. The Russian cuts match those of Canada’s Potash Corporation, the largest producer in the worl, which has taken 1 million tonnes off the market since last year. For Eurochem to hurry a fresh 2.3 million tonnes from Gremyachinskoye on to the market would be folly, as the price it would fetch would probably be lossmaking. Mining the law courts may look a better bet to Melnichenko, especially if he must pay his lawyers less than the $15 million in overdue invoices from Shaft Sinkers for the work done but not paid for when the contract was halted. Asked what problems in Kazakhstan Melnichenko and Eurochem have across the border, Eurochem sources initially claimed there weren’t any. 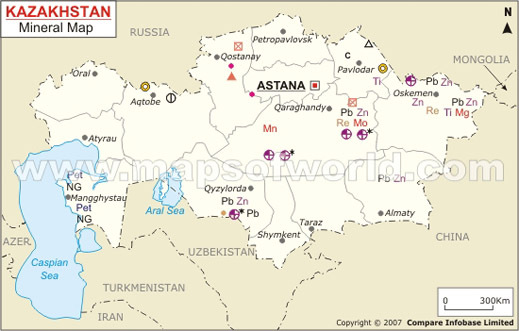 Kazakhstan holds substantial reserves of mineable fertilizers, particular phosphates. These are concentrated in the southern regions of the country, between the cities of Shymkent and Taraz. According to Eurochem’s financial report for 2012, issued on February 7, 2013, Melnichenko has two projects in Kazakhstan – one at Karatau, where Kazphosphate is already mining; and one at the Kok-Jon and Gimmelfarbskoe deposits, which have been partially explored but not yet mined. According to Eurochem’s papers, “to increase upstream integration, we plan to start phosphate rock mining in Kazakhstan’s Karatau Basin from 2013”; and “we are looking to increase our vertical integration by extracting phosphate rock from the Kok-Jon and Gimelfarbskoe deposits in Kazakhstan’s Zhambyl province”. Melnichenko isn’t mad. But the Kazakhs are impatient. They think there is a four year-old promise to start the mine with targeted production tonnage and estimated revenue and cashflows. So how much has Eurochem actually spent at Karatau since 2009, and is there a problem between the company and the Kazakh mine licensing authorities? There is domestic rivalry for Eurochem from several sources, according to those familiar with the matter, and this is too sensitive for Eurochem to acknowledge, particularly as it doesn’t have to do so for public shareholders. 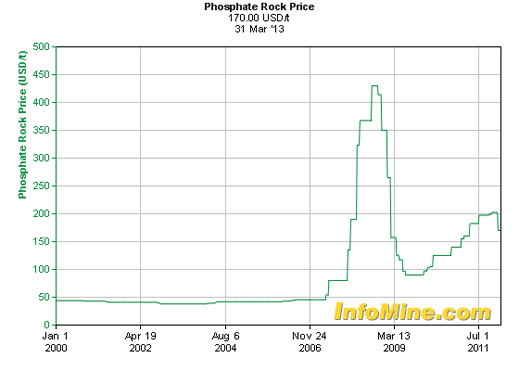 The phosphate prospects are also not so attractive that Kazphosphate was able to sell its shares in a London IPO it was contemplating in 2009. Nor was Melnichenko willing to buy a 50% stake in Kazphosphate the year before, at least not at the reported asking price of $400 million.